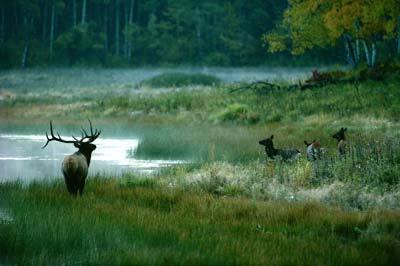 Does greenspace have a value? Werner Stiegler, arguing for more public green space in Florida, said “One needs to look no further than real estate ads to see that the demand for greenery is strong. It is common for ads to reference proximity to parks, and the value of greenery is often reflected in the price of properties close to green spaces.” Why should this be so? What is it about images of nature that so captivates us? Why do we seek recreation as an ‘escape’ from the city to ‘nature’? 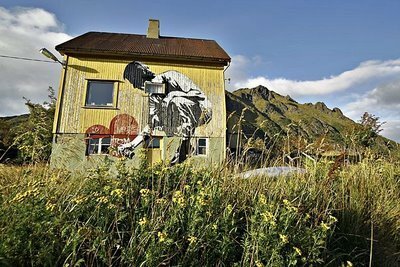 This entry was posted in Landscape Architecture on 29th December 2008 by Christine. A friend with enviable portfolio of major projects, says that ‘We have to call ourselves urban designers to get the work. But we have to employ landscape architects to get the work done’. Another friend who spent many years teaching urban design to architects, planners and landscape architects remarks that ‘the landscape architects were the best’. 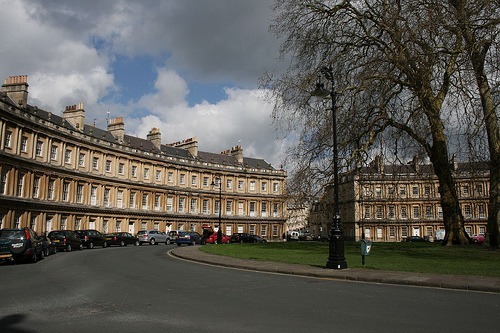 The Circus in Bath (UK) is a fine example of architecture+landscape but the idea (from John Wood) was of course inspired by Bramham Park (photograph of The Circus courtesy Casey Picker). And the central void makes the cartwheel useful. And the empty space makes it valuable. And these openings make the room livable. The central void makes The Circus useful. Buildings are moulded into a vessel. Or would he have noted that The Circus is more Visual Space than Social Space and remarked that landscape+architecture= urban design? This entry was posted in Landscape Architecture, Urban Design on 26th December 2008 by Tom Turner. This brilliant photograph, by Masahiro Hayata, combines the spiritual glory of a gothic vault with the transcendent luminance of a stained glass window. The avenue is formed with the oldest surviving tree species on earth, the only survivor from prehistoric times. The Ginkgo was widespread 270 million years ago but disappeared – except from a small area in Central China. The seed was taken to Europe, from a Japanese temple garden, by Engelbert Kaempfer in 1692. Kaempfer was a German naturalist, traveller and physician who wrote an important account of Japan and also made the first accurate drawings of Persian gardens. 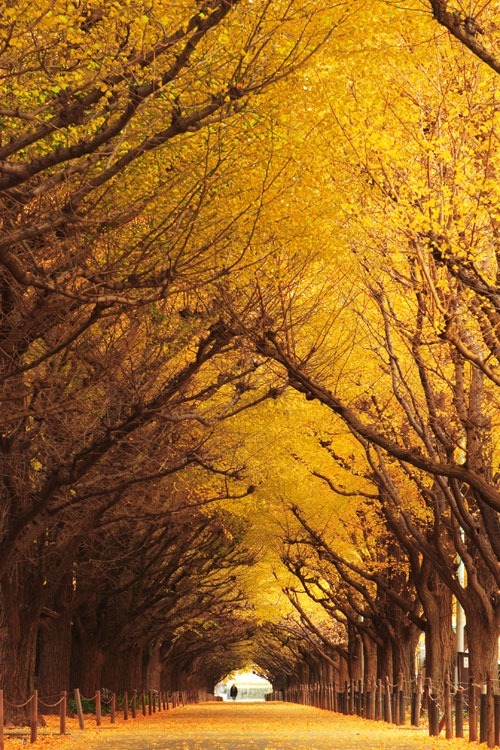 The 300m Ginkgo Avenue is in the garden of the Meiji Jingu (shrine) in Tokyo. It commemorates the 1867 Meiji Restoration, which led directly to the astonishing modernization of Japan: the landscape architecture of this photograph involves many interests. This entry was posted in Garden Design, Garden travel and tours, Garden Visiting on 15th December 2008 by Tom Turner. This entry was posted in Garden Design on 11th December 2008 by Stefan. We are grateful to Grün Berlin for the recently uploaded photographs of Sudgelande are also pleased to have a Head Gardener’s Comment. We look forward to having Visitor Comments and Head Gardener’s comments throughout our Garden Finder Section. It had details of 2,440 gardens on 10th December and has 2,442 places on 11th December. New entries are always welcome and we worry that some countries (eg Israel) are seriously under-represented. 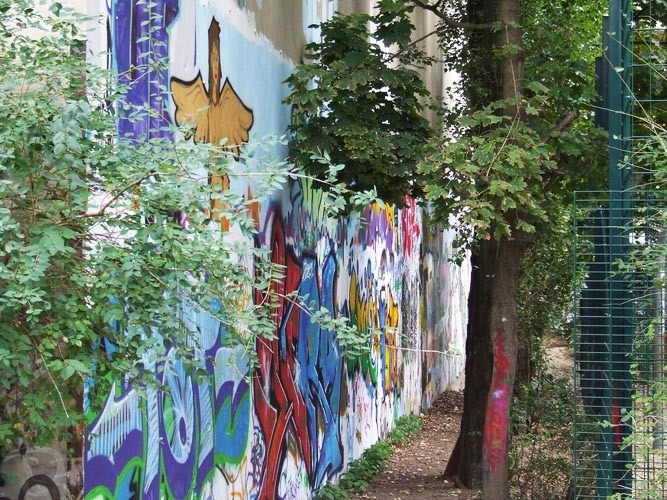 This entry was posted in public art, Public parks on 11th December 2008 by Tom Turner. Only 12 days until the winter solstice: its time to be thinking about next year’s garden tours! While planning a Cornwall garden tour, we produced an eBook on the subject. 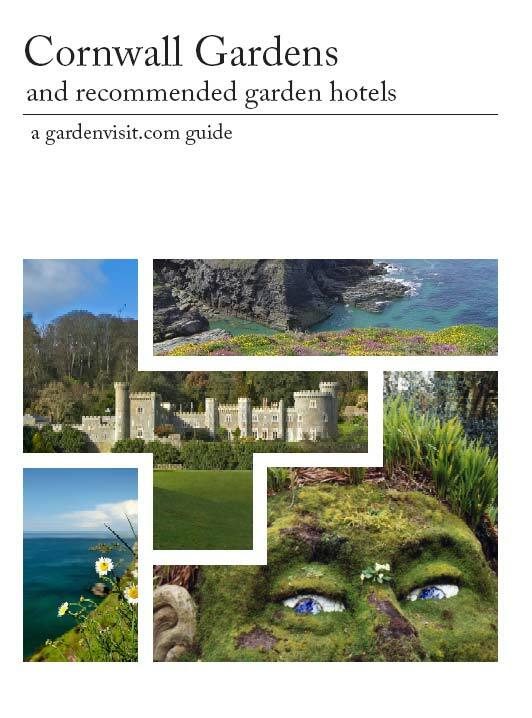 It is available for free download from our Gardens in Cornwall page. If any readers have further suggestions on where to go and which hotels have good gardens, please add a comment below! We would be pleased to include the information in a revised edition of the Cornwall Gardens eBook. The eBook has information on eight top Cornwall Gardens – and also John Claudius London’s notes on his 1842 Cornwall Garden Tour. He was very ill and only spent a few days in the Duchy but his remarks are of considerable historic interest. Loudon was the most prolific garden writer who ever lived and perhaps the only polymath to take on the subject. See also: Garden Tours in Cornwall. This entry was posted in Garden Design, Garden travel and tours, Garden Visiting on 9th December 2008 by Tom Turner. 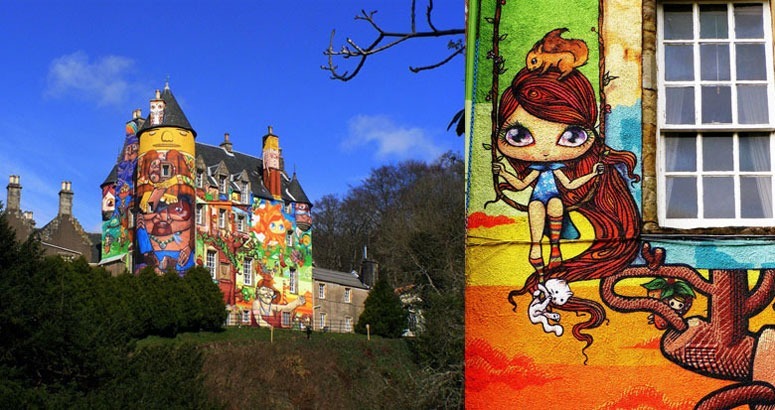 Kelburn Castle. Images by flickr user guinavere. My local council detests graffiti artists. A rapid response team in CBRN Suits (chemical, biological, radiological and nuclear) soon arrives with tanks of noxious chemicals. Understandably, allowing citizens to paint wherever they wish without permission is an unworkable situation and definitely not one I am going to argue for. However, sometimes I feel too little thought is put into whether the environment has actually been improved with the odd dash of new paint here and there. So, I was delighted to find a more-enlightened attitude on the Glasgow Riviera. Kelburn Castle has been in our Garden Finder for ages, without being on many people’s must-see garden lists for Scotland. 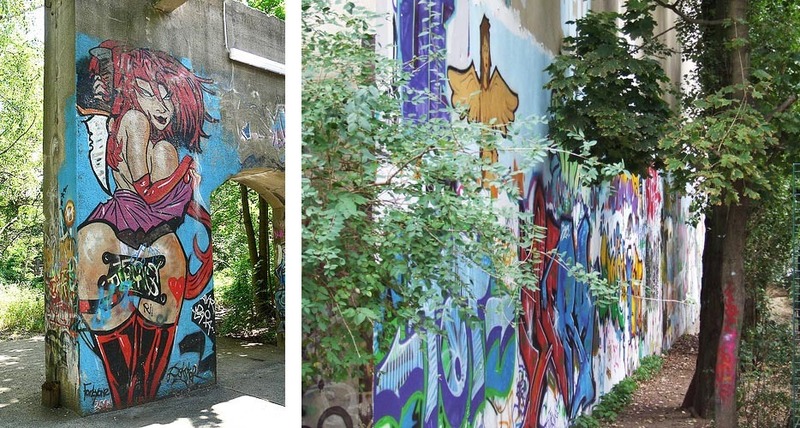 Then they employed Brazilian Graffiti artists for a paint job. Now it’s a real spectacle. On cold winter days Kelburn blazes on the landscape as though on fire. Is it Art? Or should someone call the CBRN guys as soon as possible? Peronally, I love it. This entry was posted in Garden Visiting, Historic garden restoration on 9th December 2008 by henry. Modernism, in one sense, became America’s post-war style. Designers in the UK and Australia looked to the United States for the new direction. Perhaps this is the legacy of the Bauhaus? Yet, one of IIT’s (the New Bauhaus) famous sons is Charles Owen. He is known for the customer-centric process called ‘Structured Planning’: “Structured Planning is a methodology that generates and optimises the insights and information necessary for planning customer-centric service systems, and has the added advantage of enabling traceability of decision-making, a feature that is particularly relevant in an accountability-focused government environment.” Owen’s philosophy of the customer-centric process is clearly different (if not in opposition to) the idea of the crafts-based artist expressing an inner drive which is representative of his historical time. Or is it so different? 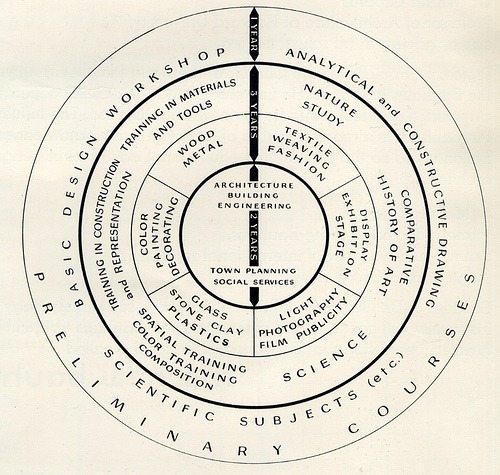 The diagram (http://flickr.com/photos/21525853@N00/2291690514/ ) is from the 1939 brochure of the New Bauhaus School of Design. 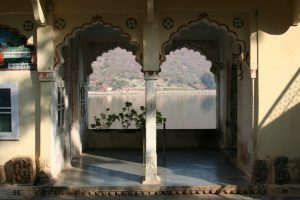 It has Architecture and Engineering at its heart and Nature Study near the periphery. Garden design and landscape architecture do not appear on the diagram. This entry was posted in context-sensitive design, Urban Design on 9th December 2008 by Christine. even more protection for the most ancient artefacts in the park: the remains of a roman temple and the Saxon burial mounds. The greatest possible care should go to the vestegial grass on the burial mounds: it may be the most ancient grassland in the whole of South London. a full archaeological investigation and restoration of the Le Notre parterre. This is the only work in England by the greatest landscape designer of the seventeenth century and, some will argue, the greatest landscape architect who ever lived. The parterre is currently managed as though it were a football pitch. The lawn and its chiseled grass banks should be maintained with the precision they deserve. the Giant Steps which ran up the axis from the parterre to the Greenwich Observatory should be restored using modern grass reinforcement techniques. They were the central visual component of the seventeenth century design for Greenwich Park. Restoration has been considered on several occasions. The proposed 2012 Olympic Equestrian Event creates an opportunity to act. 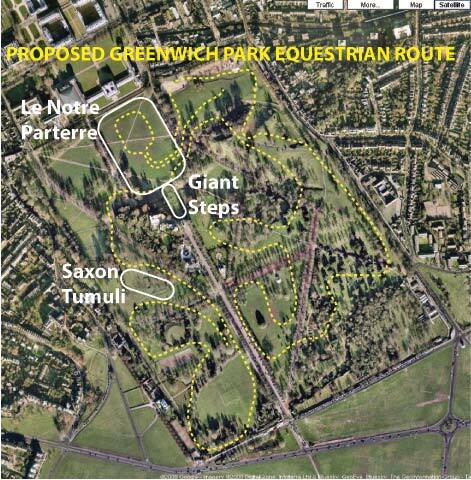 Note: for more discussion see article on The Conservation of Greenwich Park. 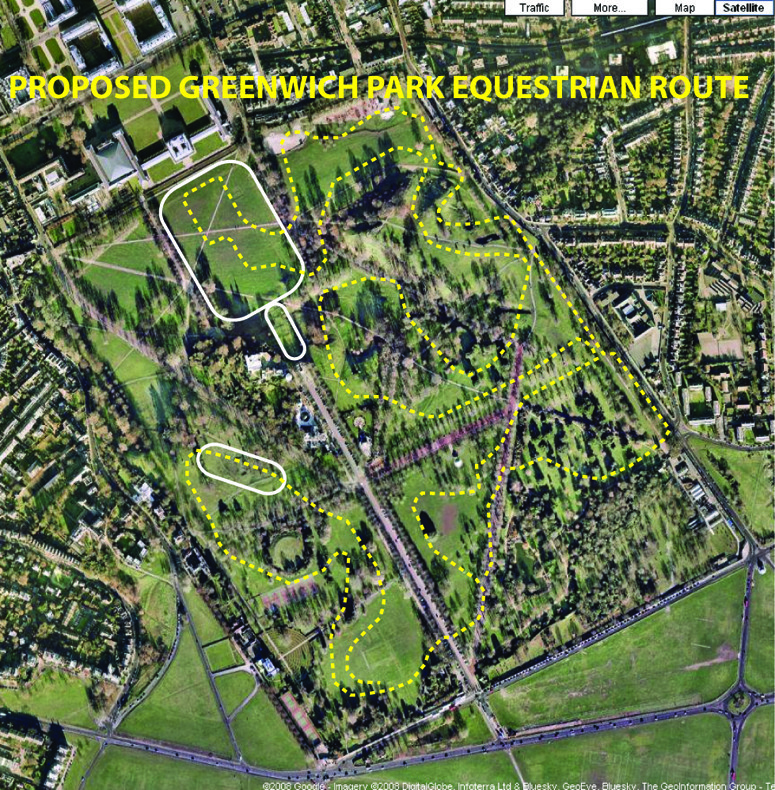 A revised plan for the equestrian route was published in The October 2009 “Greenwich Park Venue Update”. It is shown below, on a Googlemap. Their plan shows it avoiding the Anglo-Saxon Tumuli but without a geophysical survey how can they be sure? This entry was posted in Historic garden restoration, Landscape Architecture, Public parks on 7th December 2008 by Tom Turner. I am NOT however arguing against innovation, which local people and tourists can all appreciate. I am arguing that every design team MUST explain and MUST justify the contextual approach they have adopted. Similarity, Identity and Difference are all welcome in the right circumstances. Garden travel is one of life’s great pleasures – and it helps one see that Russian design should not be copied in China, French design should not be copied in Russia, American design should not be copied in Dubai, British design should not be copied in India, Japanese design should not be copied in America, etc etc etc. Mobile phones and cameras are international go-anywhere products. Designed gardens and landscapes should have local roots, however much they learn from elsewhere. Curiously, designers often understand this best when working outside the countries in which they were born. This entry was posted in context-sensitive design, Garden travel and tours, Urban Design on 3rd December 2008 by Tom Turner.